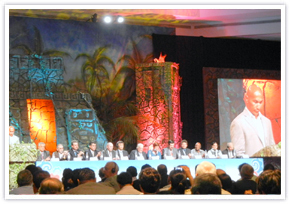 On November 14-18, International Co-operative Alliance (ICA) held its general assembly in Cancun, Mexico. 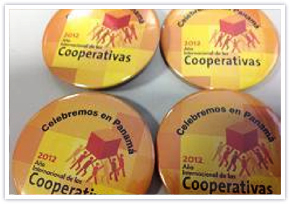 The assembly focused on “Cooperative enterprises build a better world” which is the slogan of the 2012 International Year of Cooperatives (IYC). Around 2,000 participants from 78 counties attended the assembly which also served as the launching of 2012 IYC. Ten ICA members in Japan (NFUCA/National Federation of University Co-operative Associations, JA Zenchu/Central Union of Agricultural Co-operatives, JCCU/Japan Consumers’ Co-operative Union, etc.) sent 40 participants to the assembly. 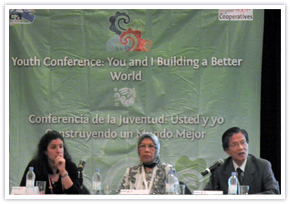 Prof. Kokichi Shoji, the president of NFUCA, made a report as one of the panelists in Youth Conference, outlining the society, co-operatives and university co-ops in Japan; international activities; activities for 2012 IYC in universities and university co-ops in Japan. Regional Global Network that is composed of co-operative institutions discussed on how to make universities and colleges adopting co-operative education in their regular program. 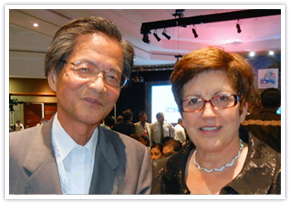 Prof. Shoji made a report on activities of university co-ops in Japan. NFUCA also called for co-operatives in higher educational institutions to have a round table discussion. Participants from 6 countries shared their activities and regional/global promotional activities.